← What’s all this about VSPEX? VPLEX is THE solution that enables you to have the exact same information, in two separate locations, accessible simultaneously from both locations. VPLEX makes it possible to access the same information at the same time from two locations. VPLEX is really really cool. So, what is happening in the VPLEX space? 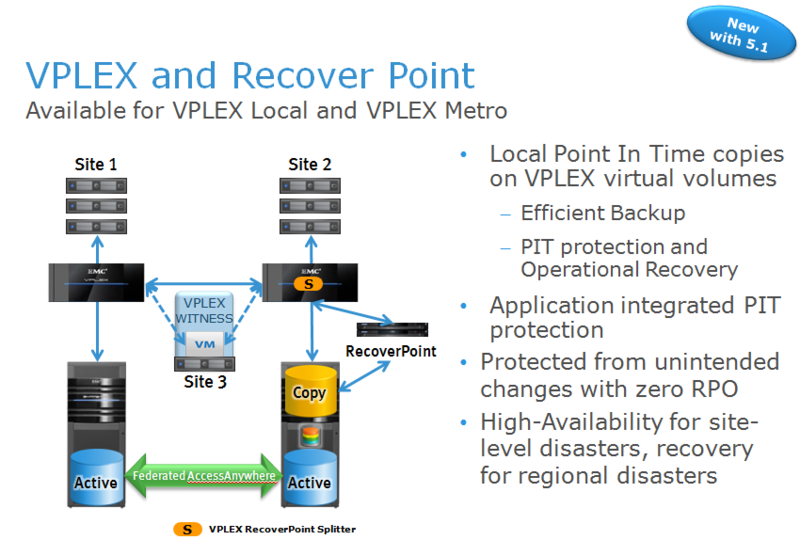 VPLEX RecoverPoint Splitter – For enhanced operational and disaster recovery for VPLEX Local and VPLEX Metro. 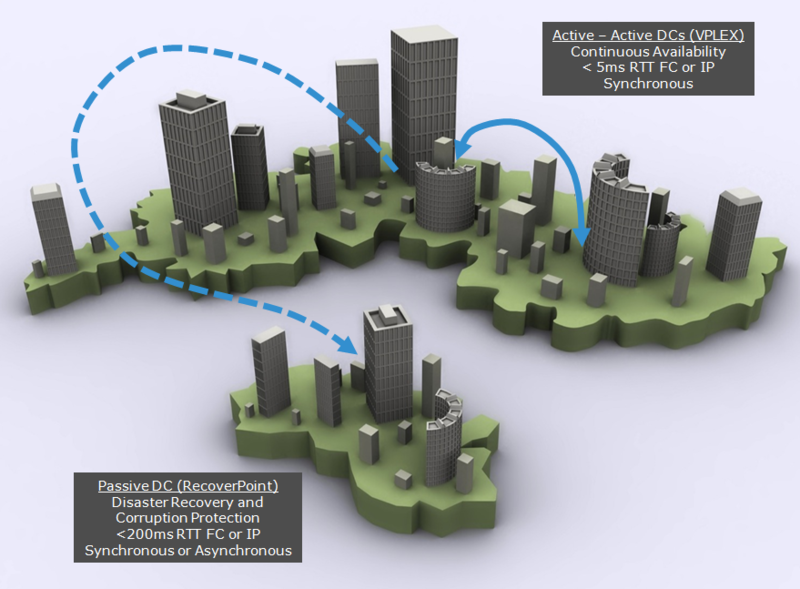 Yes, that’s right, VPLEX + RecoverPoint = Simultaneous active-active information access from two sites with full DR functionality to a third site. Sound pretty cool, right? Well you can get it now, and while you’re at it you can make a Non-disruptive upgrade from VS1 to the newer hardware version VS2. No downtime whatsoever. Let’s have a closer look at the largest improvement in this new software release, namely the RecoverPoint splitter (the picture you saw above). A normal VPLEX Metro cluster has two sites, with access to data available at both sites at the same time. Writes are written to arrays on both sites simultaneously, and reads are delivered by the array that is closest to the host. When introducing the RecoverPoint splitter in VPLEX, you get the possibility to leverage Local Point-In-Time copies of all your VPLEX volumes. This is great news as you can leverage these local copies for efficient backup, or Point-In-Time protection and recovery. Whatever the topology, VPLEX and RecoverPoint provide application-level consistency and recovery for federated, clustered, physical, virtual, and private cloud environments. Disaster Avoidance AND Disaster Recovery! So with VPLEX and RecoverPoint you no longer have to choose between a Disaster Recovery plan or Disaster Avoidance, you can have both! Continous Data Protection (CDP) can be used to create continous PIT checkpoints of critical data for fast and efficient local restore, with a very small RPO compared to recovering from a full replica. You can also leverage the entire Continous Remote Replication (CRR) feature in RecoverPoint together with VPLEX, meaning you’ll be able to have Active-Active datacenters with a third recovery site. Can you spell A-W-E-S-O-M-E? This entry was posted in EMC, RecoverPoint, SRM, VMware, VPLEX. Bookmark the permalink.